August | 2013 | Mike Lamberti, From Margate To Cleveland, And Back ! Demikoff challenges his team…..To Bowl ! Wayne Hills football coach Wayne Demikoff has never questioned his team’s ability or talent. He has, however, gotten on the Patriots for what he perceives as a lack of mental toughness at times, noting the players need to work through the grind of two-a-day practices and be stronger for it at the end of the sessions. So, on Aug. 20, as the team prepared for the second of its workouts, Demikoff called a quick meeting in the locker room prior to the start of the afternoon session. The players didn’t quite get it for a second, but then quickly realized that the afternoon session would be spent in an air-conditioned bowling alley close by to the school, instead of donning pads and helmets under the 80 degree sun. The hooting and hollering were a release of energy for the kids and Demikoff had to revert to his whistle to get the team’s attention. Assistant coach Jon Goldstein was the main force behind the event, having planned the afternoon out a few weeks ago, ‘Goldy’ even had lane assignments for all the players, from freshmen through seniors. The afternoon off was a welcomed relief for the team, which had a spirited, hard-hitting practice earlier in the day. The bowling went well for the Patriots, who genuinely seemed to enjoy the time away from football, but with their teammates. Steve Pusterla of Wayne Hills seemingly has it all. A senior and captain of the highly successful football team, Pusterla has a championship ring from the 2011 season and a ton of ambition for the future, which for him, begins now as the 2013 gridiron campaign approaches. Even a broken collarbone, suffered during a non-contact drill on Aug. 7, has provided a minor road block for his plans to excel this fall for the Patriots. But when Pusterla and a group of his senior teammates made a recent visit to the Wayne PAL as part of the program’s community service, he made a friend in Adam, a young man full of energy and enthusiasm, who is a huge Wayne Hills football fan. 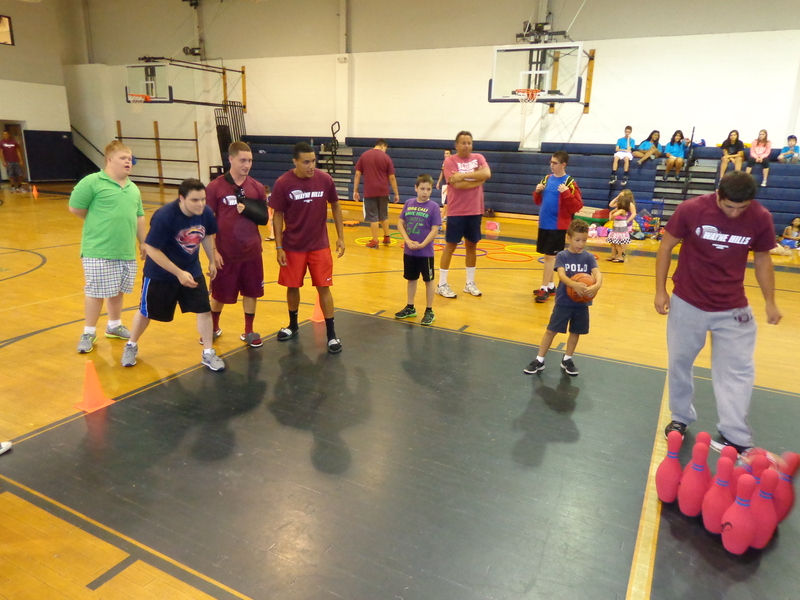 Steve Pusterla (standing, far left) poses with Adam (in green shirt) during Wayne Hills’ visit to the PAL on Aug. 15. The Patriot players visited the PAL and played games with the youngsters there, some of whom are autistic, while others may have handicaps, but embrace life with a huge smile and tremendously positive attitude. The children’s zest for life clearly affected the Patriots, and Pusterla was one of those who thrived on the need to give back. 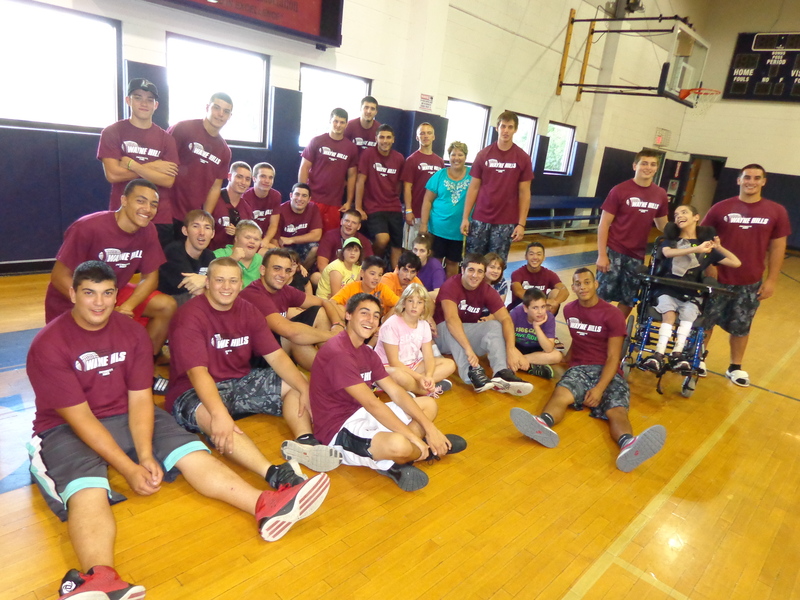 Wayne Hills players gather with children at the Wayne PAL. Among the other Wayne Hills players at the PAL were team captains Justin DeGroat, James Kelly and Erik Martinez. Wayne Hills head coach Wayne Demikoff was ecstatic with the event and hopes the team will return to the PAL and work with the kids during the season. Bowling was a big event for the kids at the Wayne PAL. For all intents and purposes, the 2013 football season at Wayne Hills began about 10 days after the Patriots dropped a 20-11 decision to Pascack Valley in the state sectional semifinals last Nov. 30. At Wayne Hills, championships have become the norm, so when the team struggled last year to a 6-5 campaign and an ouster in the semifinals for the first time in nine years, a sense of urgency was almost immediate for the returning players. Add to that a new coaching staff, led by head coach Wayne Demikoff, who succeeded his long-time boss, the legendary Chris Olsen, and the Patriots’ 2013 season has a new look. The team began weight lifting in December and amped that up in early January, as usual. Demikoff was officially approved as the team’s head coach in February, relieving a lot of anxiety from the players who clearly wanted their former defensive coordinator as the new head coach. Demikoff’s first order of business was putting together a coaching staff. While a number of coaches from the Olsen era have returned, there’s a new offensive coordinator (John Jacobs) and defensive leader (Jermain Johnson), as well as new lines coaches. Jacobs and Johnson were both head coaches in 2012 at West Orange and Paterson Eastside respectively. The team began summer, non-contact workouts on June 11, then went away to camp from June 30-July 3 at East Stroudsburg University. Summer workouts continued, including 7-on-7’s before a 10-day break in late July, early August. And now, on Aug. 12, the pads are on and the intensity level revved up another level. There’s just 31 days before the regular season opener, at Northern Highlands on Sept. 12. In between, there are there scrimmages and the annual Maroon and White scrimmage, set for Aug. 17. While the dynamics with the new coaches has been good since the team began official workouts in June, the message got through on Aug. 12. And Johnson also wanted the defense to know the score. And with that, the 2013 football season at Wayne Hills is certainly underway now.